Are you interested in making money with pay per lead affiliate programs? Want to know how they work and where to sign up? Look no further. Here I have covered the best affiliate programs you can join and how to make money with them. There are plenty of pay per lead affiliate programs available nowadays. Just select the affiliate program which is closest to your niche, sign up and start monetizing your blog. 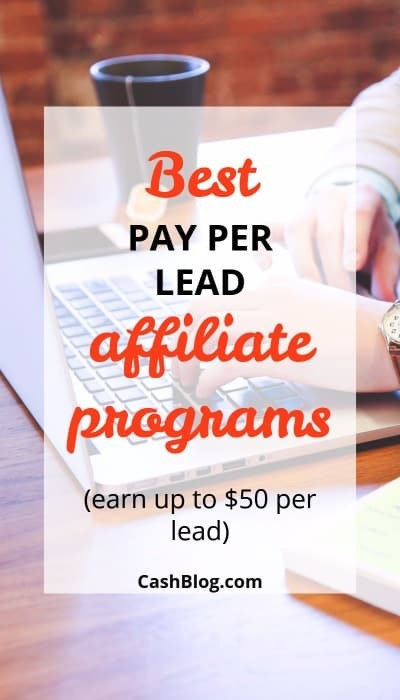 What is a Pay Per Lead Affiliate Program? How is PPL Different from CPA? What Do I Need in Order to Make Money as a PPL Affiliate Marketer? Can I Place PPL Affiliate Links on My Social Media Channels? You’ve Made it This Far, Now It’s Your Turn to Try Your Hand at Pay Per Lead Marketing! When you sign up for an affiliate program, you are agreeing to help another company market their products to potential customers. 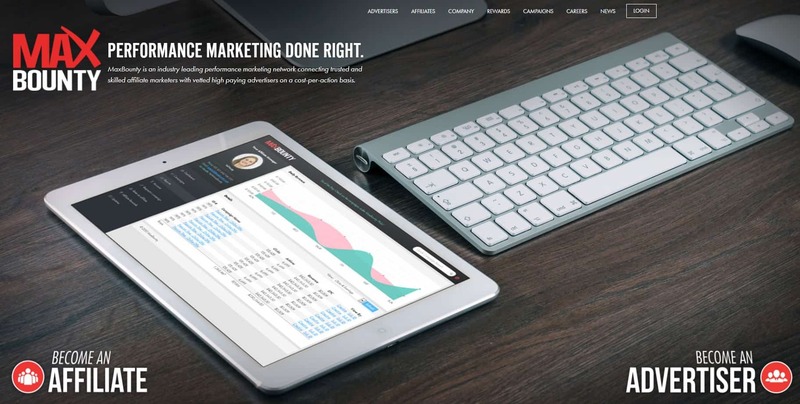 Website owners love affiliate marketing programs because it allows them to cash-in on their web traffic without the hassle of developing products, fulfilling orders or handling customer service inquiries. 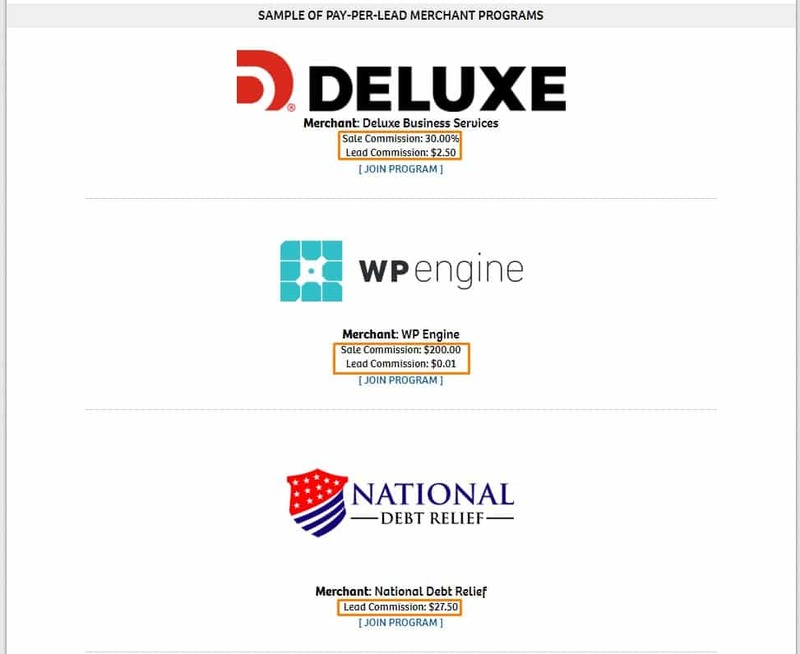 A pay per lead (PPL) program allows you to cash-in on any qualified lead you create for your affiliate partner. This is different from most affiliate marketing programs, where you would need a successful sale to occur before you earn a commission. Signing up for a mailing list. Signing up for a free trial. Downloading software or a file. The key here is that a qualified lead takes action, beyond simply visiting the site that you send them to. Some sites will only pay for qualified leads, while others will pay for any traffic you generate, with a bonus based on the percentage that become qualified leads. There are many, many types of PPL relationships. It’s important to read the Terms and Conditions for the affiliate program you’re interested in joining. Cost per Acquisition (CPA) is a form of affiliate marketing where affiliates are paid a commission for every new sign-up they generate. For example, if I wanted to build a new streaming service to compete with Netflix, I might offer affiliate marketers the opportunity to earn a commission on every new subscriber they help me generate. With a PPL arrangement, I would offer affiliates a commission for simply generating a stream of visitors to my site. I might limit payouts to a certain number of actions, but it wouldn’t be limited to newly registered subscribers. A simple click or two from a site visitor could generate a payout to the affiliate marketer. I create a blog that speaks to fashion trends and caters to a very specific type of fashionista. Based on the behavior of past visitors, I know that the people reading my blog are motivated to click on coupons and other ads that offer them unique savings. However, I’ve had difficulty getting them to sign up for my mailing list or “like” my social media pages. A PPL program based on clicks and engagements, without requiring the visitor to disclose personal details, could be a great fit for my audience. I could earn a commission for every new visitor I send to a site, as long as they click on the right button – something I know they’re relatively willing to do. This same audience would be difficult to convert on a site they’re unfamiliar with. If they’re unwilling to give me their email address, even after multiple site visits, I’m pretty sure they’ll be very hesitant to give their details to a new site – even if they get a free trial in return. In this scenario, purely based on the behavior patterns of the audience in my niche, I would prefer to sign a PPL arrangement with the website that wants my help marketing their brand or website. It’s very important to look at the terms of the arrangement. Sometimes the higher-payout could justify a potentially lower conversion. But you’ll know more once you start putting your marketing efforts into practice. Almost every major company or e-commerce site offers an affiliate marketing program. But, it can be difficult to access. Some companies hide behind affiliate networks – only allowing members of specific marketing platforms to earn commissions. Other sites, like Payoneer, allow any site visitor to learn about their affiliate program. To see if a site you love is actively looking for affiliate marketers, scroll to the bottom of their homepage. You should find a simplified site map that directs you to their affiliate program. One of the largest PPL platforms is shareasale.com .Based in Illinois, they work with brands around the world – providing a platform for brands to engage with affiliate marketers in a variety of niche industries. One of the things that I like with this site is that they allow you to easily scroll through the brands they work with – even before you complete the free sign-up for their platform. You can also easily see the various payouts that brands offer. Some combine traditional PPL commissions with affiliate sales commissions. So, if you send a customer to their site and they purchase something, you gain both a “lead commission” and a “sale commission”. This is an excellent way to maximize your earnings as an affiliate marketer. Most bloggers that are successful with affiliate marketing choose to focus on a narrowly-focused niche market. They develop rapport with their audience by providing up-to-date information about topics that matter to them. And, they are seen as a subject matter expert in their field. This is attained through months, and sometimes years of producing in-depth articles and guides. When you start pushing an affiliate link on your readers, it’s important that the link doesn’t appear spammy. A spammy link is usually something that appears out of place, or blatantly promotional in a way it detracts from the user experience. ShareASale makes it easier to find quality affiliate partners that are relevant to your site’s industry or area of expertise. Along the top of their page, you can view their brands based on the category of products or services they offer. Pay Per Sale: This is the traditional affiliate marketing arrangement. You’ll earn a commission for every sale your marketing efforts help to generate. Pay Per Lead: You already know that one! We covered it above. Pay Per Click: This is an opportunity for a site owner to place a specific ad (usually a banner) on their website. For every click, you’ll earn a set commission. It doesn’t matter what the visitor does once they arrive on the destination site. You can use Advanced Search (per sale commissions, cookie length, auto-approval of affiliates etc. ), Keyword Search or Browse by Category on ShareASale. There are plenty to filter out to find your best matches. You can sign up for ShareASale here . 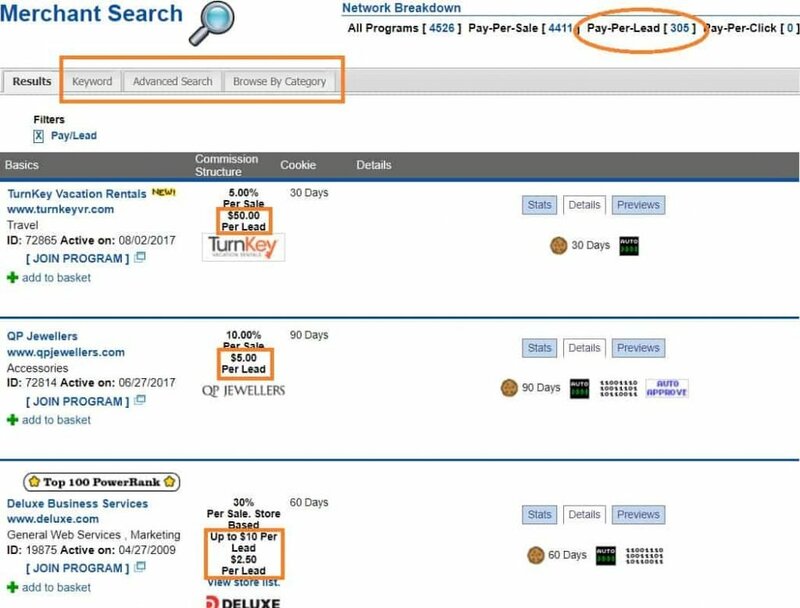 Another great platform for finding brands that are willing to pay per lead is PeerFly. They are an established marketplace with thousands of well-respected brands. One consistent thing you’ll read about PeerFly is the strength of their tracking system. They built their entire infrastructure from the ground up, so it’s capable of doing some pretty advanced tracking. Tracking is important for affiliate marketers because it allows you to dig beneath the surface and find where traffic is coming from, and how different types of traffic behave. For example, if you have an entire section of your blog dedicated to sports memorabilia, wouldn’t it be helpful to know where that traffic is coming from? Based on their geographical location, you can prioritize content about specific teams or franchises that are hyper-relevant to your audience. While a lot of this type of information can be gleaned from Google Analytics, you need a strong tracking partner to understand what your audience is doing after they leave your site – hopefully following your affiliate links. This platform provides their publishing partners (affiliates) with a powerful dashboard that helps inform future marketing strategies. 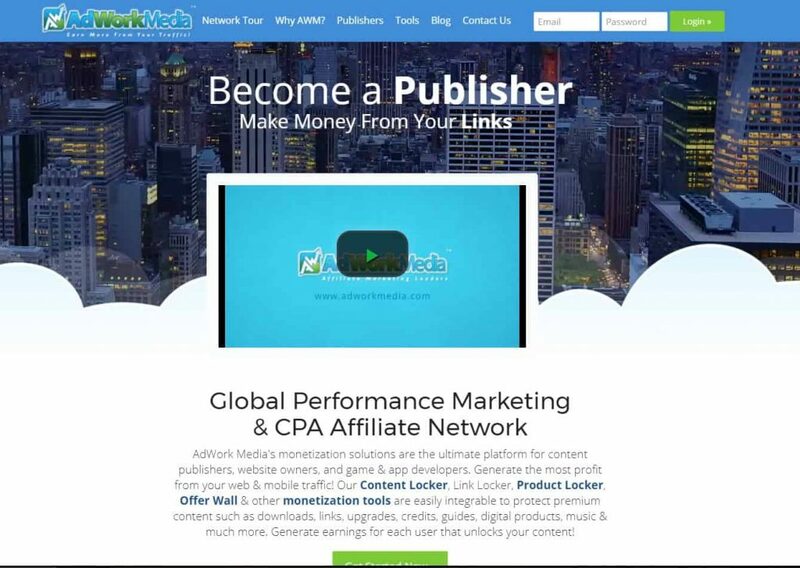 With the amount of free educational material, like their Beginner’s Guide to Affiliate Marketing Terms, you get the sense that this is a platform that supports publishers of all experience levels. Other PPL networks include AdWorkMedia and MaxBounty. The key to earning maximum profits from your affiliate marketing efforts is signing up for multiple networks. Every audience is unique, and finding the perfect offers that excite them will take time. The more PPL opportunities you have, the more likely you’ll be able to find offers that are relevant to your audience. It’s also important to scour through various networks for similar offers. The way that a promotion is positioned can have a huge impact on its success. You want your audience to fully engage with the opportunities you give them – resulting in more money in your pocket. To find the perfect offer, I like to do my own version of A/B testing. This involves finding two similar offers. Then, I insert the first offer into a targeted blog post for 3-7 days. After I feel like I’ve gotten a decent sample size, I do the same thing with the second, similar offer. Based on the data from these tests, I can see what types of ads, promotions and offers my audience prefers to engage with. I’m not just looking at the number of clicks. I’m also diving into the amount of revenue I generated for myself. You might be surprised at the results. If neither offer performs well, I test as many offers as it takes until I find a winner. A lot of online marketers make the mistake of limiting themselves by only testing a few ad / content combinations. The more testing you do, the easier you’ll be able to recognize a high-performer. By doing this exhaustive testing, an underperforming blog (with a decent amount of traffic) can become a strong revenue generator within a few months. Don’t be fooled by the advertisements from companies that try to sell pay per lead affiliate marketing as a “get rich quick scheme”, or the easiest way to make money online. Affiliate marketing, no matter its form, takes a lot of hard work and talent. I firmly believe anyone can be successful, as long as they are willing to put in the time and effort. But, if you’re looking for a simple, fast, turn-key way to make money online, keep looking. Time and motivation to learn all you can about your chosen industry, and the companies that want to sell to your audience. A blog. I recommend WordPress because it is a free platform that can be hosted anywhere. Plus, there are millions of plugins to make it do some pretty cool things – even if you aren’t a professional coder. A domain. This should be easy to remember, and relatable to the audience you’re trying to cultivate. Enrollment in at least one affiliate marketing program. You can definitely reach out to companies personally, but it’s a lot easier to startup and get going if you can gain access to multiple offers at once. When creating content for your audience, it’s important you take into account the way humans have evolved and adapted to the modern internet. Digital marketing is so prevalent and pervasive that it can be extremely difficult to get people to pay attention. Can you remember the last time you noticed an advertisement? I bet it was clever and hyper-relevant to you. And, it probably didn’t show up in the same location as the other 200 million ads you filter out every day. Because of the amount of advertising we’ve been inundated with, our behaviors have changed to help us filter out the noise. Even though your eyes still register traditional advertisements on websites, your mind filters them out before you consciously focus on the information that you’re trying to consume. 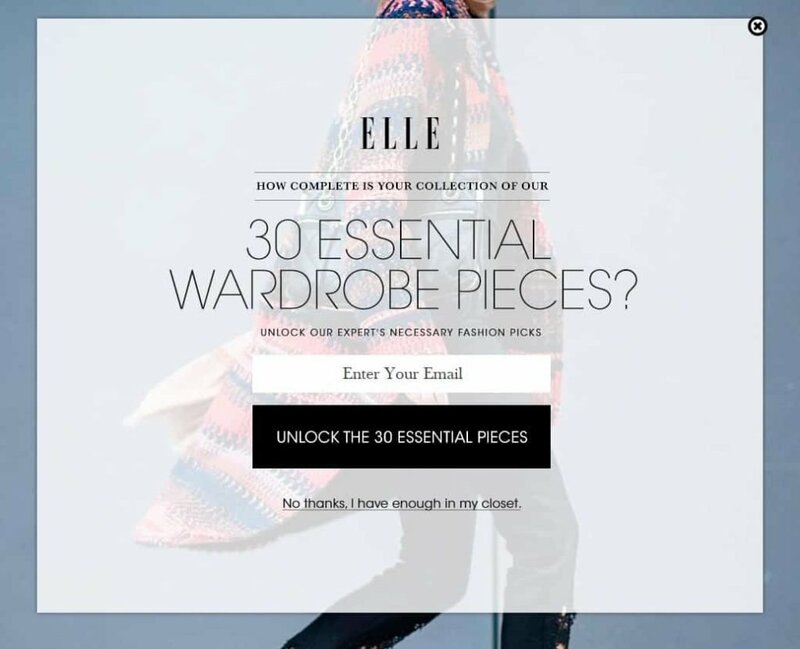 If you look at ELLE, one of the most popular fashion and design sites on the web, you’ll notice something different. They’ve changed up how ads appear in their content. And, they’ve chosen to place large graphics at the top of their articles – further camouflaging the placement of their ads. The educated answer to that question is that this ad, which is targeted based on my past browsing history and geographic location, has been placed there by Google’s advertising network. Want to cheat? See the blue triangle in the upper-right hand corner of the banner? Yeah, that’s Google’s standard “AdChoices” button. If you click on it, you’ll take a dive into Google’s AdSense Help page. While Google’s advertising network is generally a PPC (Pay Per Click) network, if this ad were placed directly by the school, it would almost have to be a Pay Per Lead campaign. Why? Google does an excellent job of tracking clicks and personalizing advertising to the end-user. But, in a more direct relationship, the easiest way to track the success of the ad placement would be to pay ELLE a commission for every new student packet that the site generates, based on ELLE’s placement of their ad. 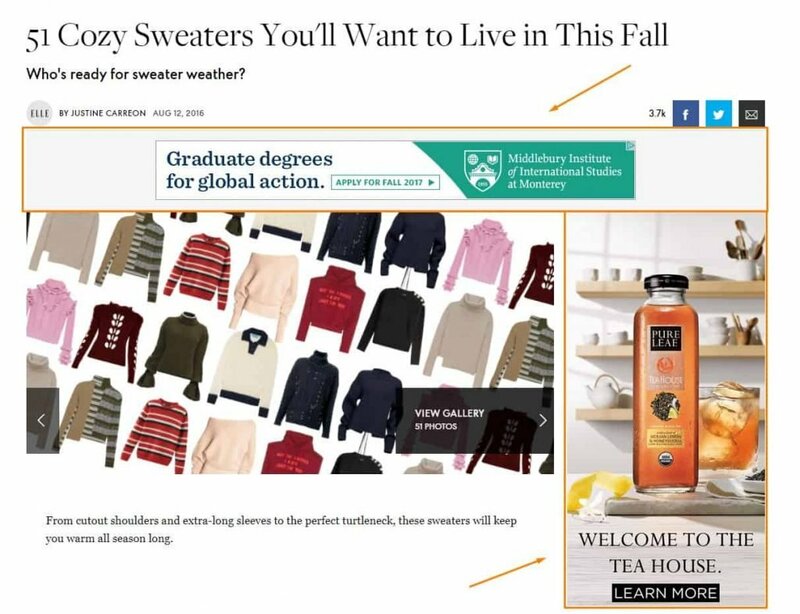 With the placement of the ad more perfectly blending into the actual content, it is very likely that the reader will notice and consider its content. And, if all else fails, ELLE has that covered too. The splash-ad above completely covers the screen after 20 seconds. So you’ll definitely be paying attention to one of their ad campaigns (both internal and 3rd party) during your visit to their site. The genius behind a blog collecting email addresses from its most loyal readers is that you open the door to even more advertising opportunities. In addition to publishing content, and hoping your loyal fans rediscover it, you can directly message them with content you believe they’ll love. And, you can even place pay per lead content in the body of the email. Just be careful! Different pay per lead offers have specific restrictions on how they can be used. It’s important that you engage in creative advertising, but try to avoid coloring outside the lines. If you do anger one of your affiliate partners, you may be removed from their account. And if you’ve committed too many violations within a network, you could even be blacklisted from an entire marketing platform. That’s a horrible situation to be in, because it makes a tough job even harder – limiting your opportunities to find fine-tuned offers that your readers will love. If you’re nervous about creating a website, and you’re a social media maven, it may be tempting to skip building a site and immediately start posting your affiliate links to all of your social media followers. CAREFULLY READ THE TERMS OF YOUR PPL AFFILIATE MARKETING AGREEMENT. The vast majority of marketing networks prohibit publishers from placing affiliate links on their Facebook wall, post comments, or social media bio. Why? Brands don’t want their products and online reputation to be seen as spammy and low-quality. To empower social media junkies, most networks are instead allowing publishers to create “promoted social media posts”. These are posts that are created on social media sites, like Facebook. They are not posted on a private wall, or spammed across comment sections. 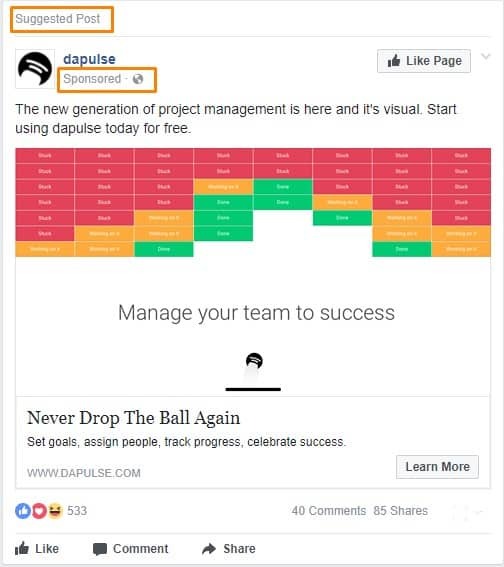 In the example below, dapulse (or one of the marketing partners) is paying Facebook for the placement of their post with a dedicated link to the promoted content. In this instance, it’s both possible to “like” dapulse’s Facebook page, as well as visit the sponsored link. And, if they really get lucky, you might even “comment” or “share” the post with your fellow Facebookers. Again, I can’t emphasize this enough – this is a tightly regulated form of PPL marketing. Your marketing agreements will specifically layout what is and isn’t allowed. And, even if you follow the rules, the cost of running the promoted post might mean that you lose money in the end. For these reasons, I prefer to only use social media to promote my personal blogs. The content I publish there has affiliate links within the articles – strategically placed to leverage the unique interests of the readers that find my articles helpful. And, because I own the blog that I’m promoting on Facebook, all of the brand exposure primarily benefits me – which is only fair, considering I’m making the investment. The only way Facebook’s users see the PPL link is if they read my article (not on Facebook) and then view / click on the link that I placed within it. And, of course, I disclose any affiliate links I place within my content – because the trust of my readers is key to my long-term growth as an expert in my niche market. Both advertisers and publishers can benefit from cost-effective affiliate marketing, like Pay Per Lead (PPL) marketing. Online marketers love PPL programs because it allows them to earn a commission on a larger portion of the traffic they send to their promoted sites. And, because money doesn’t have to change hands, there’s no waiting around for sales to be finalized. And with all of the PPL marketing networks out there, it’s easy to get your foot in the door with a large number of companies that want their chance to wow your readers with their exciting products and unique offers. It’s my hope that you learned everything you need in order to start cashing in on your own PPL marketing efforts. You can do this! Seriously, all it takes is time and dedicated experimentation to find the perfect blend of content and offers. If you have any questions or comments on this article, I’d love to speak with you in the comment section. We all become better, more effective marketers when we work together! Suppose u have a shoe e-commerce store and you are looking for the lead for your business. The lead form consist of 5 field I.e. Name, email, phone number, city and gender. How much commission are you going to pay an affiliate marketer for each lead.? You probably want to surf around and see how much other shoe or fashion merchants are paying for their affiliates for leads. Another place you could check out is OfferVault, just to get some ideas. plz tell me the solution for this.Because interesting for this question. Very informative and helpful. Thank you for providing this info! I find affiliate marketing scary and confusing but this helps a bit! Nice article I must say..
You have broken down the technicalities for new aspiring affiliates..
Just to be little helpuful to your amazing audience I would like to disclose; We at expressjinni.com are currently recruiting affiliates. We are a new emerging e commerce platform that serves the global customers. Interested people can check out the details at our homepage footer area. Thanks and have a great day to whosoever reads this and we welcome you to join our expressjinni associate program.